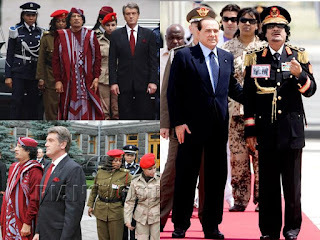 As of this writing, Libyan dictator Muamar (or "Muammar" or "Moamar", etc.) 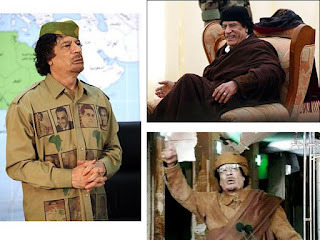 Gadhafi (or "Gaddafi" or "Qaddafi" or "Khadafi"...) is getting more isolated especially in the international community but still holding out. He should have more surprises in his sleeves, the way he was able to stay in power for 41 years, going 42 this year. We read in the news various names of opposition leaders in certain areas within or outside of Tripoli. 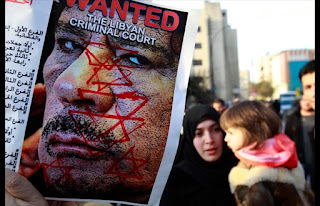 But these names are generally "new and strange" for new watchers of the political development in the Middle East-North Africa in general, and Libya in particular. 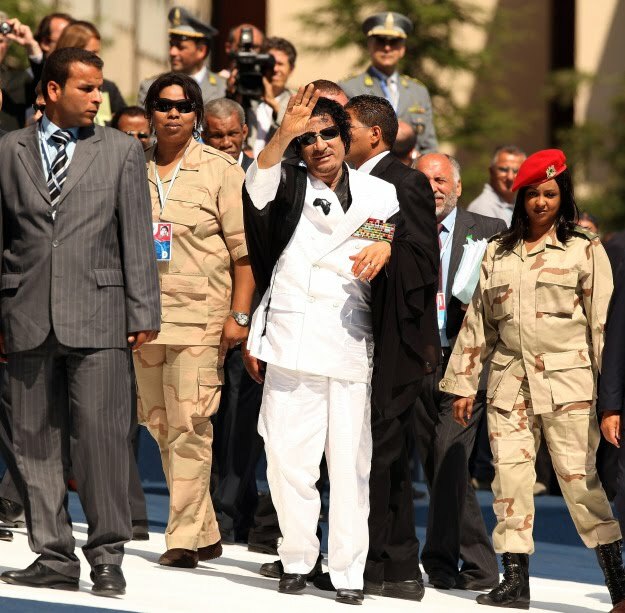 Mr. Gadhafi has succeeded in crippoing political opposition to his four decades in power. In fact we read more the names of his sons, those who were primed and trained to succeed him, than the names of any stand out political opposition leaders. This is a real problem for countries under dictatorship for many years. Only the dictator and his few powerful supporters, the military leaders, are trained for political succession, and their main agenda is simply to continue the "happy days". 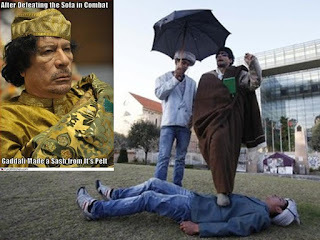 A few Filipino friends who work in Libya -- they should be on their way back to Manila already, if not here already -- told me last week that there is a big question mark of who will succeed Gadhafi if he is toppled in power as an organized and disciplined political opposition was generally absent. 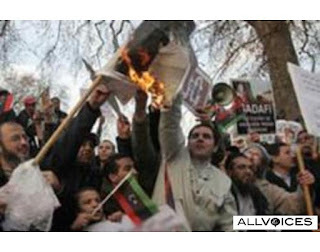 On the days of demonstrations against the dictator in Tripoli, there were several instances of looting, burning and plain disorder. Meaning the political unrest was an opportunity for thieves and other criminals to come out as there was no clear organized group/s yet who can discipline those thugs and criminal opportunists. 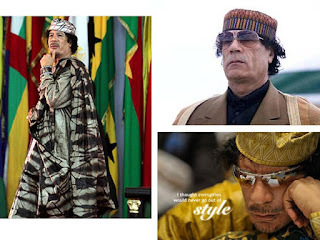 The way things are going, with more explicit pronouncements and warnings from leaders of more powerful countries like the US, Gadhafi is not going to last long. 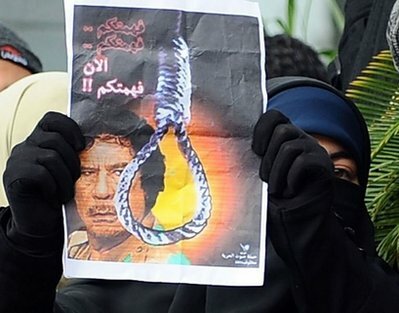 The question only is how much destruction in properties, how many hundreds of casualties and injured people more, will be sacrificed before Gadhafi, his family and closest supporters, will be toppled. Should that event happen, the next step is to institute a democracy in the shortest time possible. That the next set of leaders will be popularly supported, and not just a rehash of past Gadhafi supporters who suddenly became "opposition". Then bring to a national or international court Mr. Gadhafi and his family so that past crimes will be unearthed and accounted for. The institution of democracy is not the ultimate goal per se, in Libya or elsewhere. Rather, it is the promulgation of the rule of law. Thieves, plunderers and murderers must face the courts and be appropriately penalized. A clear statement should be made to the public and the succeeding governments. The law against stealing, the law against killing, the law against corruption, should be upheld at all times in all places. Whether the country is under a democracy, autocracy, theocracy or other forms of government. Twenty five years ago today, former President of the Philippines, Ferdinand Marcos, was toppled by the 1st People Power revolution in the country in 1986. He has been in power for more than 20 years then, 1965 to 1986. 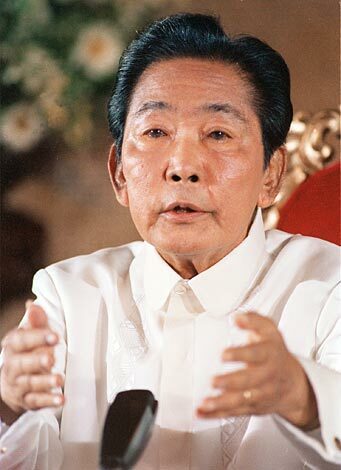 When he declared Martial Law in 1972, his second and last term was about to end by 1973. The 70s was also sort of "A decade of dictatorships" in East Asia and other regions and continents. This picture was during his ageing years in power, sometime in the mid-80s. As usual, all pictures and caricatures in this article are from the web, not one of which I took or created. 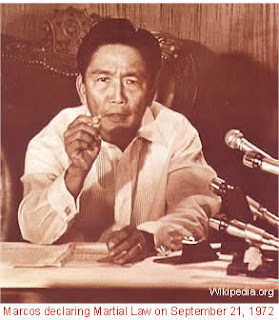 Upon declaring Martial Law in the entire country in September 1972, he abolished Congress and started ruling by decree, the notorious and multiple "Presidential Decrees". Even the Supreme Court and the lower courts were forced to work with him and justify his ruling. The military and police became abusive, hauling many people critical of the man to jails or simply killing them. His friends and cronies started sectoral monopolies -- in steel, sugar, coconut, airline, and other sectors. Days were good then to simply take over businesses, especially for ventures owned by those critical of him. 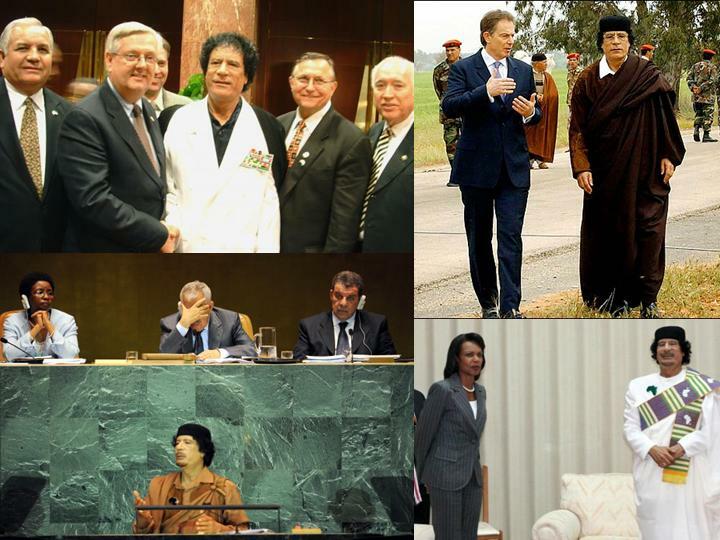 He was not alone of course, in his dictatorial leadership. Behind a corrupt man is a corrupt woman, his wife, Imelda Marcos. The couple was then referred to as the "conjugal dictatorship." The lady was known for creating some grand projects, a few of which later became white elephants. She was appointed as Governor of Metro Manila, Minister of Human Settlements, and other high posts. Among her fetish was expensive shopping and collecting hundreds of pairs of shoes. She is now old, she should be in the late-70s, but still moving around in some political circles. 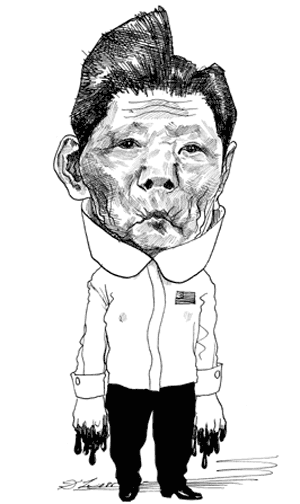 One of the cartoons depicting the man in his last few years. He was sick then of a disease called "lupus". Filipinos had a grand time then inventing jokes and laughing about him and his disease. Political jokes against dictators are one way of protest. If you can't confront them because they are legally armed and dangerous, at least you can make fun of them. Somehow this further erodes their authority. 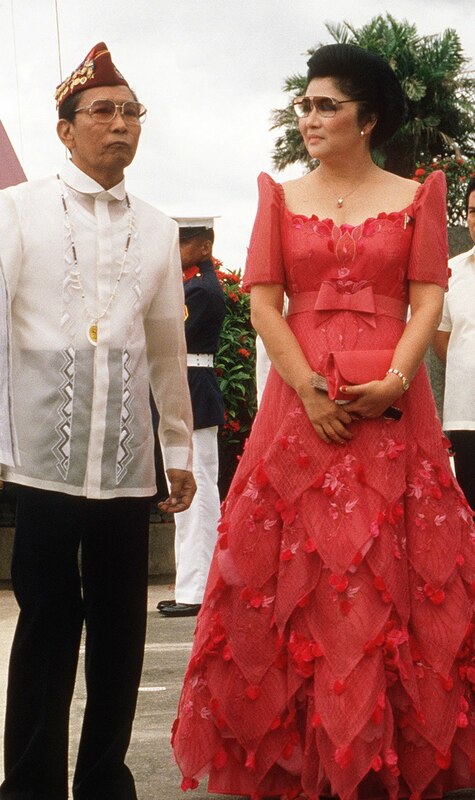 Like many dictators in the Middle East and Africa, Marcos was a good friend and ally of the US government. So it was actually a US government helicopter then airplane, who plucked him and his family out of Malacanang, then transferred to Hawaii. The woman who challenged and defeated her in the snap elections of February 1986 was the widow of the politician who was murdered in 1983, former Sen. Benigno "Ninoy" Aquino. His death angered more Filipinos. 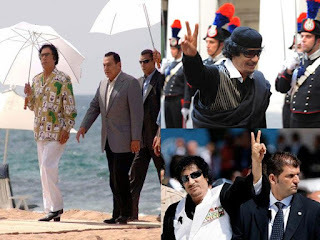 During the snap elections, massive cheating and violence characterized the event, and he was declared the "winner" of the elections by the Parliament then. 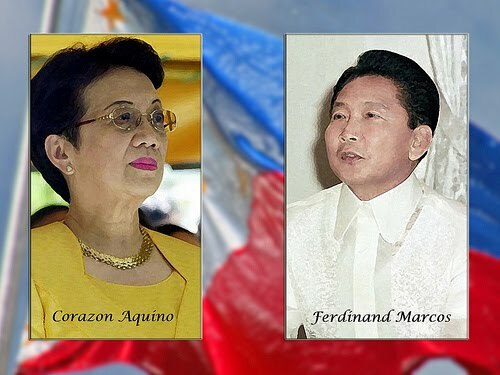 The People Power Revolution which culminated in February 25, 1986 ultimately toppled him and installed the first woman President of the country, Corazon "Cory" Aquino. It would have been better for Marcos if he relinguished power earlier by admitting defeat in the election, and not waited to be deposed from power in shame. 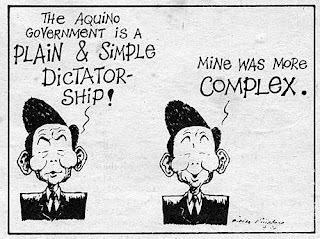 For the first time after more than 20 years in power, he and his supporters became the "opposition" and was critical of the new Aquino administration then. His supporters tried to come back in power by participating in the 1987 Congressional and Senatorial elections, but they were defeated with wide margins by the Cory candidates. Marcos died in the US while in exile. This cartoon showed his resurrection, a scary and terrorizing character. His remains are still in his hometown in Paoay, in a glass casket and open for public viewing. His family are still lobbying that he should be buried at the Libingan ng mga Bayani ("Heroes' cemetery") but all the administrations after him refused to do it. 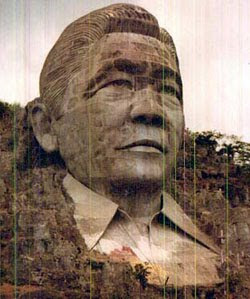 When he was still in power, he built a big structure of his face along the "Marcos highway" going to Baguio City, a famous and cold city in the northern part of the country. The joke then was that the structure was difficult to be finished. 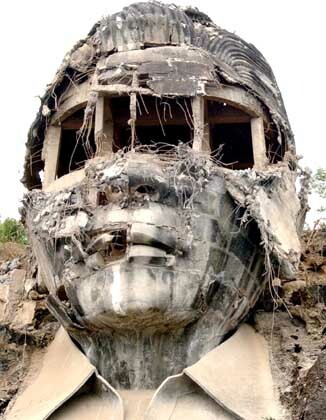 When Marcos asked the contractors what took them so long, the contractors replied, "Nauubos po kasi ang semento namin sa kapal ng mukha nyo" (the cement would quickly run out because of your thick face). When he was ousted, the structure was naturally neglected and even vandalized. A huge symbol of corruption and abuse of power was destroyed. Dictators and plunderers have their days of reckoning. 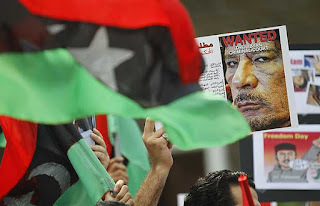 The continuing political stalemate in Libya and sporadic unrest in other parts of Middle East-North Africa (MENA) like Bahrain, Yemen, Iran and others are increasing the geopolitical risks of world oil supply gap. Some traders are getting ready that Libya's oil output of 1.7 M barrels per day (bpd) would be totally shut down later if the political crisis will continue. 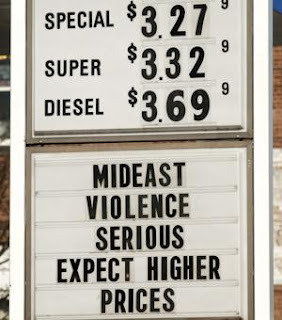 Here's a graph from The Economist this week, Oil pressure rising. Russia and the US remains the world's top oil producer but Saudi Arabia has the most or the biggest spare capacity. Oil supply shocks will be an endless issue and reality for the world. There are a dozen or more reasons why world oil prices can go up anytime, like political unrest in one major oil exporting country, or a threat of war in the region, or prolonged cooling and bitter winter in the northern hemisphere. (picture from today's yahoo news). BIG governments generally control the supply of oil worldwide. 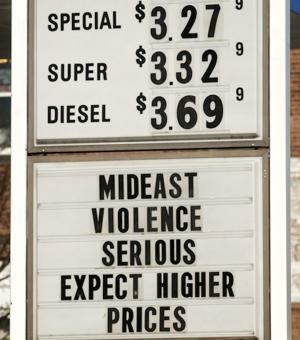 Their pricing therefore, is subject to politics, politicians and dictators. Ordinary people can only aspire to reduce (but not totally eradicate) their dependence on oil for their mobility and electricity needs. And it is here where the development and mass production of more fuel efficient cars will be gaining more prominence. Mainly for economic reasons, and not to "save the planet." People's mobility across communities, countries and continents, is part of human freedom. High mobility of people, their goods and services, at the least cost possible is a goal that science and business innovations will seek to attain. The free market system will give the private enterprises leeway to attain it. 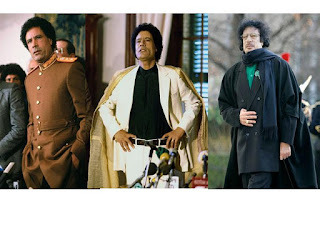 I just realized that there are many other pictures of different fashion and apparel by the Libyan dictator, Muamar Gadhafi (or "Gaddafi", "Qaddafi", "Qadhafi", "Qaddafy", there could be a dozen or more spelling of his name). It should be too space-consuming if I put the pictures one by one here, so what I did, I compiled them 2 or 3 pictures per slide. Sources of the pictures are many too. So instead of searching the web sources of the pics, I will just put a clear disclaimer: ALL pictures here were taken from the web, not one of which I personnally took. 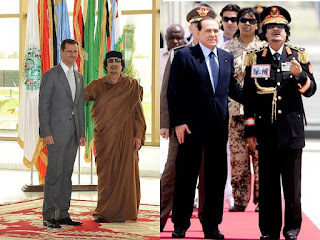 Left dress is a picture of the famous African political leaders in the past, including one of his idols, Naser of Egypt who articulated the pan-Arab world. 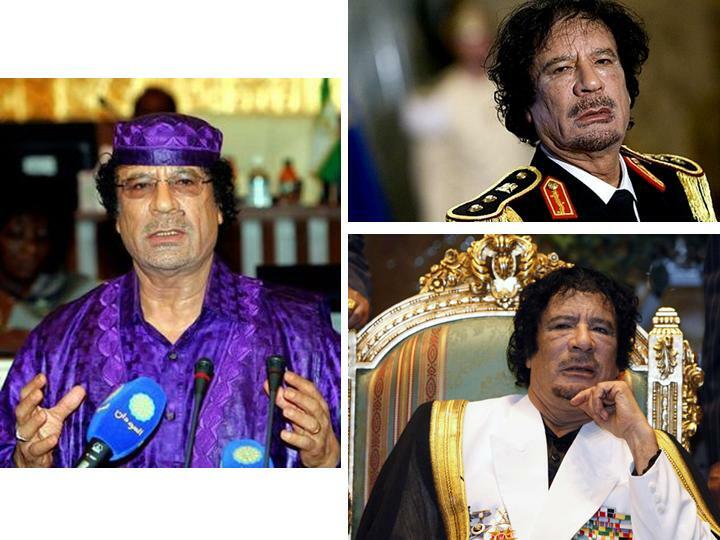 Lower right picture is among his most recent pictures, speaking on tv, rallying his supporters to keep supporting him and to attack those who oppose him. I think it was Time magazine which coined the left-most picture as among the "worst dress" by a country leader sometime in the last decade. And what is this, the man holding the Green Book as he steps on another man, to emphasize the weight and power of the "ideas" contained in that book? Sometimes he's a military general, sometimes a casual dresser, sometimes fully covered from head to toe, except the face and hands. What a guy. Meanwhile, the dictator and his army, thugs and mercenaries have already killed several hundreds. The specter of losing endless resources and privileges to dress in whatever fashion he wants scares him and his supporters a lot. The first time I went to San Francisco, California was in April 2008. My two Filipino friends in NoCal, Monchit Arellano and Kris Asinas-Cabrera, hosted and toured me around the area. Late April 2008, it was sunny and cool then. I told Kris that I wanted a picture at the Golden Gate Bridge, so she and her hubby brought me there. I liked SFO's cold but non-wintry weather. Today I just read that "not wintry weather" is not exactly true. 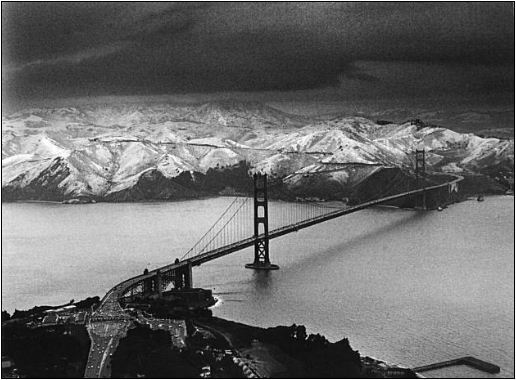 It snowed hard in SFO in February 5, 1976, the snow approached almost the sea level. This was during the global cooling in the 70s. ...SIGNIFICANT SNOW ACCUMULATIONS WILL BE POSSIBLE FOR LOCAL MOUNTAIN RANGES. EVEN COLDER AIR WILL CONTINUE TO FILTER IN THROUGH FRIDAY NIGHT WITH SNOW LEVELS POTENTIALLY DROPPING DOWN TO SEA LEVEL. There you go. Even the southern US state of California will not be spared from "catastrophic global warming". Warming causes cooling... say it again please?? Many, well majority, of governments around the world now are simply fiscally irresponsible. That is, they live beyond their means, they spend much larger than their revenues, year in and year out. And how do they fill in the annual gap between high spending and low revenues? Through borrowings, endless borrowings, so that their public debt keep rising and rising. Take for instance, this annual gap between spending and revenues of the UK government starting in 2002. These are not absolute numbers but as percent of GDP. Nonetheless the gap is very clear. Such yearly gap would require yearly borrowing so that the cumulative debt should be rising every year. 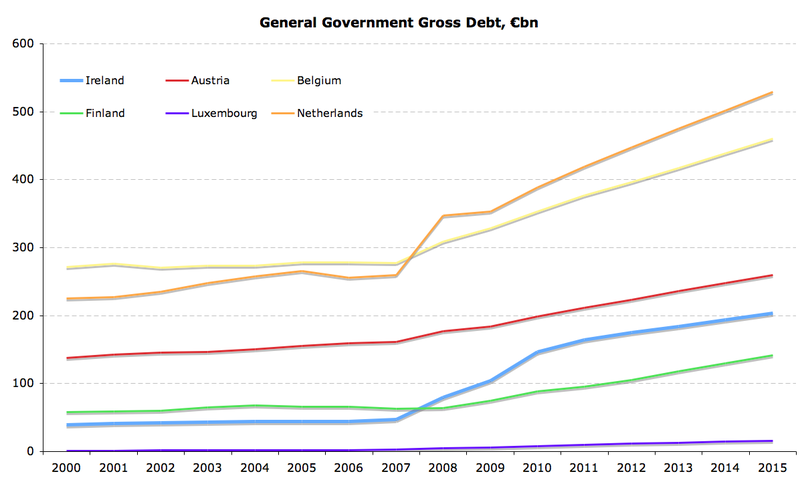 Well, many European governments are notorious for accumulating huge public debt. 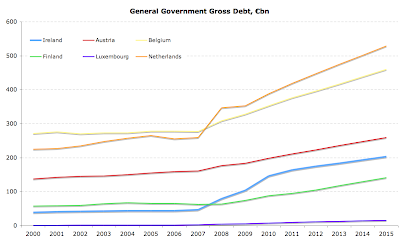 See for instance the gross debt of six governments in that continent, in billion Euros. The trend is a shameless picture of ever-rising debt. So what sort of "fiscal discipline" that these governments can preach to other poorer countries through their foreign aid projects via the IMF, WB, UN, OECD and other agencies? The US federal government is among the most notorious fiscally irresponsible ones around the world now. With budget deficit of about $1 trillion a year since last year or last 2 years, not much proof is needed. Most governments would think of more taxes and regulatory fees to raise their revenues to retire some of the debt contracted by past administrations. They always think of how to pass the cost of wastes and inefficiencies (if not robberies) to the public, not to the government bureaucracies and politicians themselves. One important measure that governments can do to significantly reduce their public debts and eradicate the need to raise more taxes and fees, is to privatize many of their assets and properties. Privatization, not more taxation, is a practical solution that many governments simply do not wish to consider. 1. Get out of the bailout business. Simply by selling the remainder of its General Motors shares, the government could net $18 billion in savings. The government should also demand GM pay back the $30 billion in outstanding assistance from TARP. 2. Lease government lands for energy production. The federal government currently owns over 85 million acres of untapped oil and gas reserves. Immediate income from auctioning federally-owned leases could total $61 billion. 3. Sell public lands. The federal government currently owns over 650 million acres of land – almost 30 percent of all land in the United States. Based on land values estimated on past exchanges, selling federal lands (exempting National Parks) could be worth as much as $230 billion. This doesn’t include the over $25 billion spent on maintenance or $347 million spent on acquisition annually. 4. Reform Federal Real Property Management. The federal government is estimated to hold 900,000 buildings and structures. GAO has warned that real property owned by the government is consistently underutilized or abused, including the government’s maintenance of its real property as a part of its High-Risk Series since 2003. Selling nonperforming real estate assets and reforming federal real estate management would save at least $4 billion. 5. Rescind spending programs that have been proven failures, such as the “stimulus” plan. The White House recently admitted that as much as $168 billion in funds remain unspent. Simply by selling the assets the government maintains, Congress could gain roughly four months and one week to debate comprehensive spending reform that would prevent lawmakers from fixating on the debt problem and refocus on the problem at hand: government overspending. 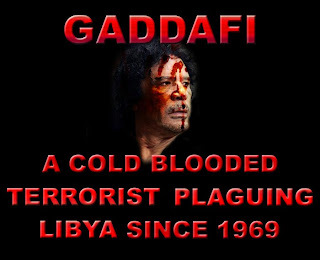 As of this writing, various international reports say that more than 200 people have been killed by the rampaging forces loyal to Libyan leader Muammar Gadhafi (or "Gaddafi", "Qaddafi", "Khadafi"). And still unaccounted for are fresh massacres by mercenaries reportedly shipped from other African countries to kill protesters and defecting soldiers. Libya is a big country in terms of land area (1.8 million sq.kms., 17th largest in the world, vs. the Philippines' 300,000 sq.kms.) but has a small population of only 6.4 million people (vs. the Philippines' 95 M). Its economy is heavily dependent on oil exports, estimated to be one-fourth of its GDP. There should be huge potential in tourism especially those coming from Europe as the country is facing a wide area of the Mediterranean Sea. To its northwest and east are Tunisia and Egypt respecitvely, whose respective long-time leaders were already toppled just a few weeks ago. 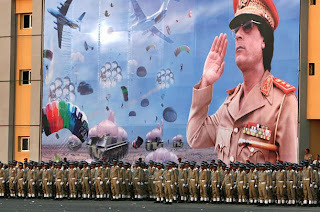 (Picture from time.com) It is the thought of being toppled from power after 41 years, turning 42 this year, that scares Gadhafi and his family and closest officials. The reason why they instituted a dictatorship is precisely to stay in power forever whenever possible. Which again, highlights the evils of BIG government, whether by dictatorship or democracy: the usurpation of so much power over the lives, pockets and freedom of individuals through various ways of regulation, taxation and ownership or abuse of the country's huge natural resources. 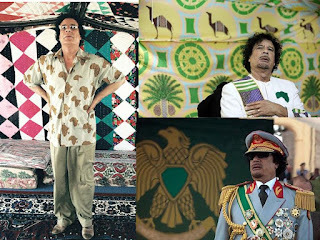 Although the Middle East and North Africa is mostly ruled by dictators, Gaddafi seems to be a different dictator judging from his lifestyle. Eccentric clothing and fashion, surrounded by shapely female bodyguards, family corporation type of political leadership. 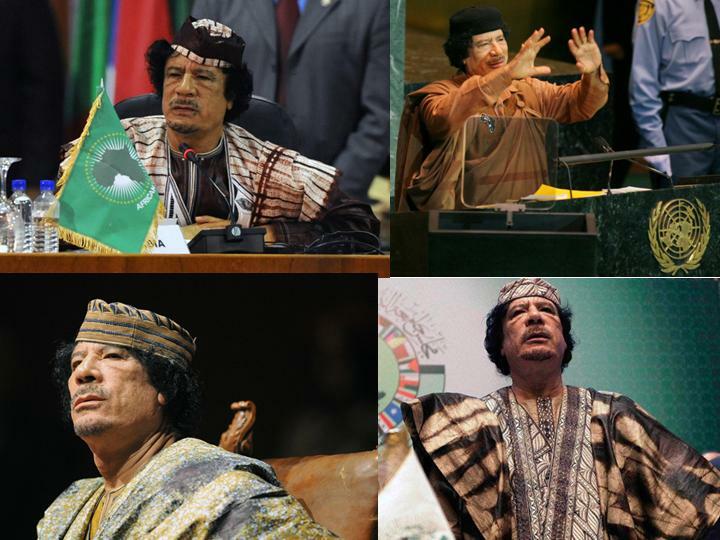 Gadhafi could be one of only two dictators in the region who is not an ally of the US. The other dictator is Iran President Ahmadinejad. 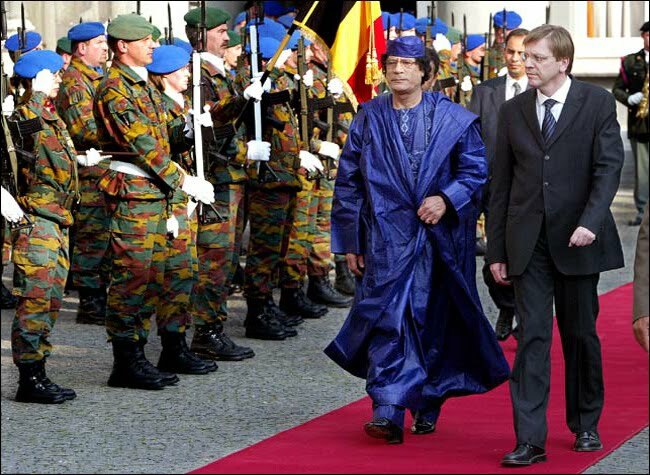 But being the leader of a big oil exporting country, many European leaders tended to be friendly to Gadhafi in the past. It is only now that many European leaders are more vocal and more explicit in criticizing the man as he has become crazy in killing hundreds of his own people who do not support him anymore. If reports of mercenaries from other African countries were brought in to shoot and kill the protestors are true, then there should be more Libyan soldiers who will defect to the opposition. Gadafhi's days in power should be numbered by now. But if the man should fall down, it will essentially be the same army who propped up his regime for four decades who will be back in power under a new administration. And it will be the same monster who has tasted huge political power and will not let go of certain privileges that are not available to the ordinary citizens. A continuation of the rule of men, not rule of law, is a big possibility. 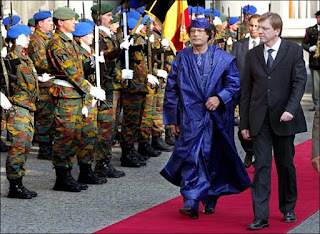 But for the meantime, the fall down of the Gadhafi dictatorship should hopefully proceed. 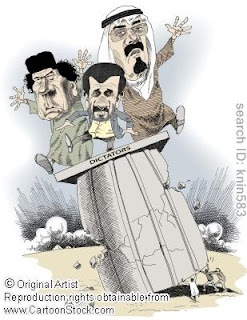 The fall down of other dictators in the region will hopefully materialize. It will be a messy and bloody battle for freedom-loving Libyans. 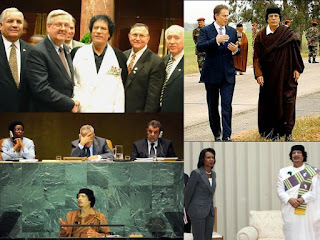 It is an exercise that we, observers from the outside, can hope will be a quick and less bloody battle in favor of democracy in the short term, and the promulgation of the rule of law in the long-term, in Libya and other countries around the world. 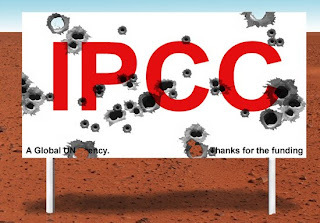 Yes, we should explain and clarify to the public: the IPCC is not and was never a scientific body. It is a political and government body, that is why it is called InterGOVERNMENTAL Panel on Climat Change. 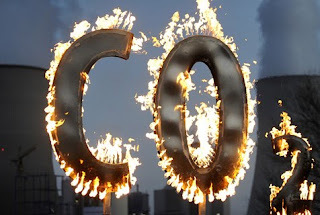 IPCC gets its funding from governments, its officials like IPCC Chairman Rajendra Pachauri, are appointed by governments. Thus, the political leanings of the IPCC and its political agenda of more environmental and more carbon regulations and taxation, jibe well with the politicians. Not one of the known leaders of the AGW scare -- Al Gore, Pachauri, Leonardo di Caprio, Lord Stern -- is a scientist. Pachauri and Lord Stern of UK are both economists. Di Caprio is an actor. 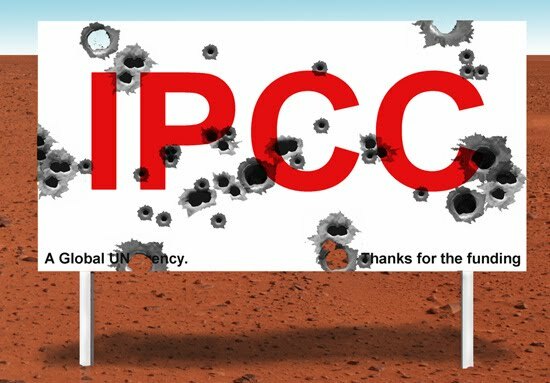 Can the IPCC be defunded? In the short run, I don't think so. Even if the US government will defund it, many governments will be more than happy to continue funding it because it is the IPCC scare tactics and pronouncements that keep fooling th public. When the people are scared of the catastrophic scenarios painted by the IPCC and other climate alarmists, then it is easy to convince them to keep paying more taxes and fees, so that the politicians can continue "saving the planet." 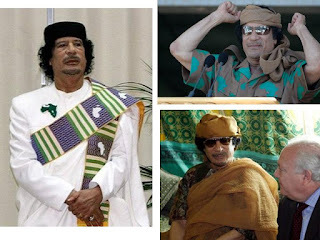 Libyan President Muammar Gadhafi (or "Gaddafi" in many other stories) will be 42 years in power this year. He might be the 2nd longest-staying dictator in the world next to Cuba's Fidel Castro. 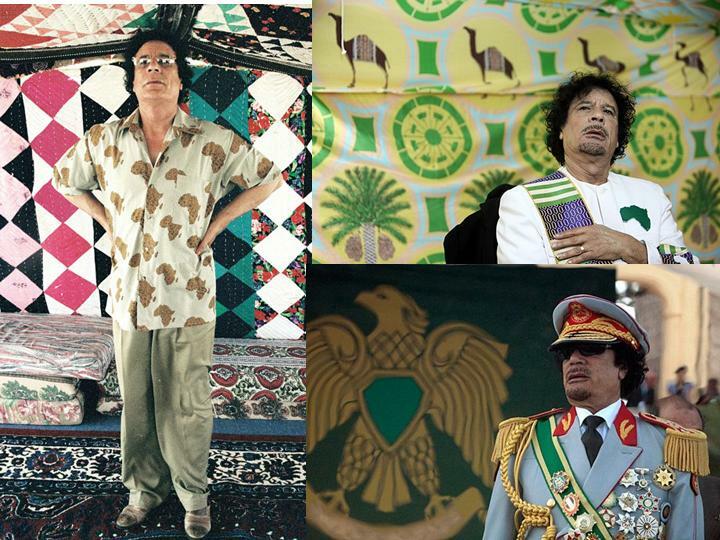 But unlike Castro, Gaddafi is known for colorful and sometimes, weird fashion. Well, weird looking for a leader of a state. Majority if not all of the pictures here are from http://connect.in.com. 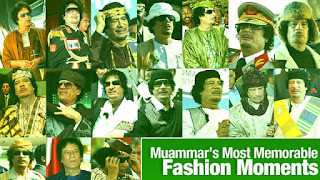 Below are some collections of his fashion. If we have bio-diversity, geo-diversity, cultural diversity, we can also have fashion diversity -- in one man. Well, he's been in power for the past 41 years, going 42 years this year. There is evolution in his sense of fashion. 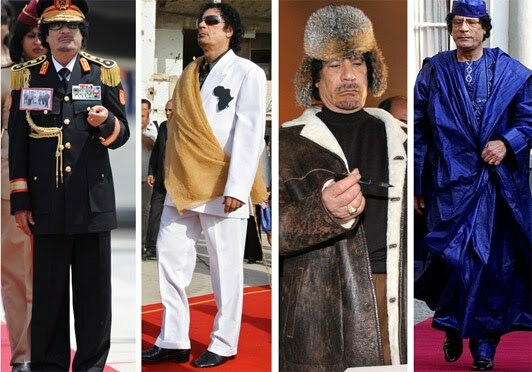 Even assuming that his overall fashion taste changes every 10 years, then there should have been four general fashion themes in the past. And more fashion, really eye-catching attires. 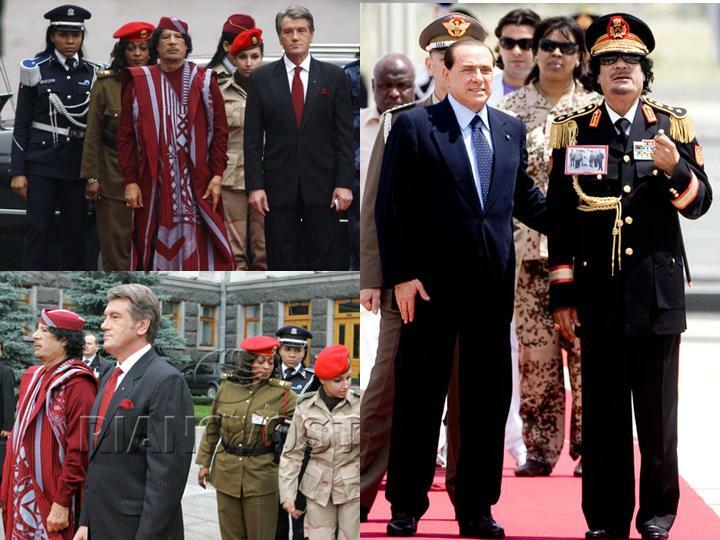 From wardrobe to thick jackets to multi-decorated military official, the variety is far and wide. Is he a state leader or a fashion leader? Seems that the quick answer is: both. Fashion evolution started showing early. A young and possibly idealistic Gaddafi then. 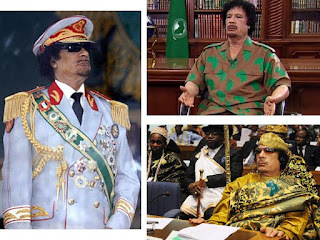 Early years in power, no fashion eccentricity. Then it just unfurled. Sometimes he appeared like a ramp model, or someone just strolling the high streets of London, Paris and New York, showing off latest design clothing. Notice that the background are sometimes tailored to the dress he's wearing for the day. When he was at the UN general assembly, he should be catching attention a lot. Most diplomats and heads of state would be wearing the usual business attire. But it seems that he never wore that usual business clothing all those years? 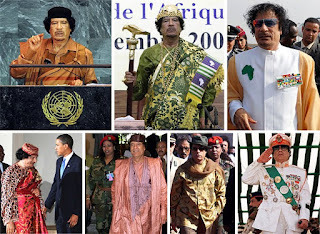 Or maybe he thought that there could be an instant "cultural day" at the UN or other international gathering. Oh yes, he did have a band. It's called the "No Hearts Club Band". 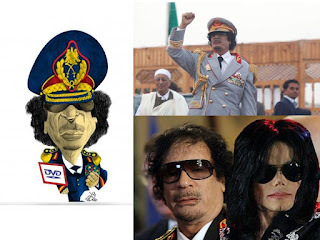 The band members include all the dictators, kings, sultans or emirs, presidents, of many countries in the Middle East and Africa. Them who have been in power for 10 years, 30 years, 40 years or more. More fashion with more state leaders. This must be during the G8 summit in Italy in 2009. 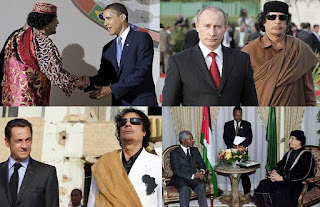 Clockwise from top left: With US Pres. Barrack Obama, Russian Pres. Vladimir Putin, UN Sec-Gen Kofi Annan, and French Pres. Nicolas Sarkozy. He's really uniquely and eccentrically dressed. At the G8 summit in 2009. 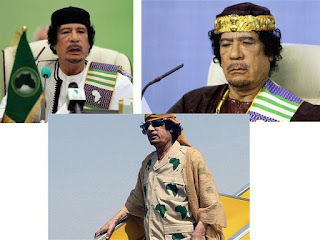 He was invited there not as President of Libya, but as President of the African Union. Former US State Secretary Condi Rice... she seemed to be distancing from him. Was he making advances on her? 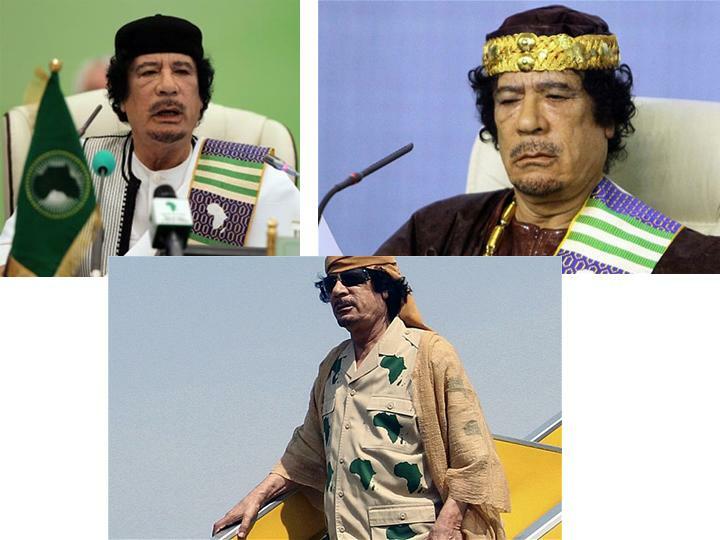 :-) Gaddafi at the UN. He used to head the UN human rights commission, sometime in the mid-80s. A visit at the EU. 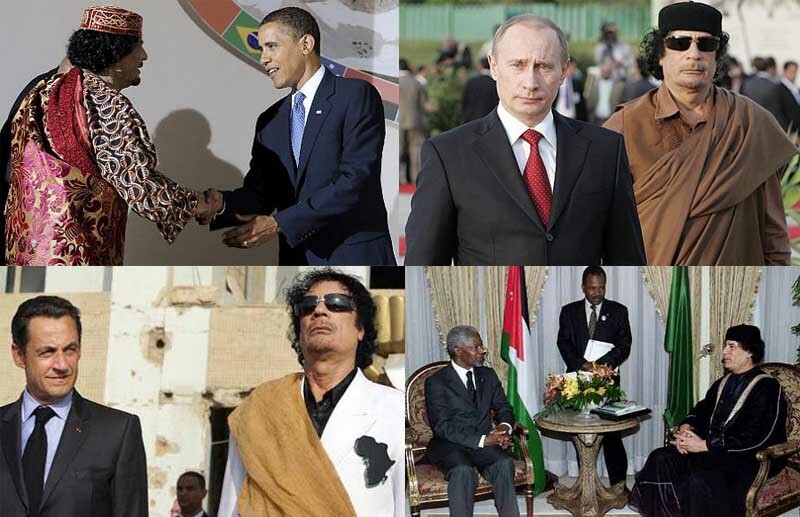 With other African leaders. Coat and tie is too boring for him. 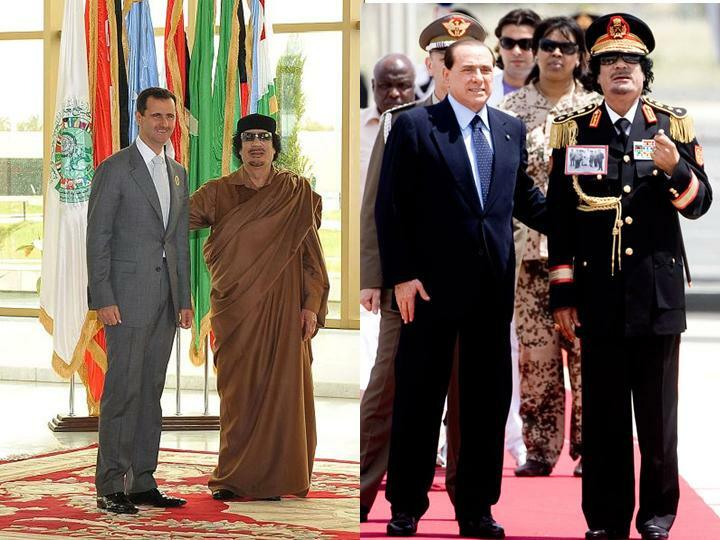 Celebrating with another dictator from another continent, Hugo Chavez of Venezuela. With the President of Syria, Bashar Al Assad. With long-time buddy, former Egyptian dictator Hosni Mubarak. With the latter's expulsion from power in a disgraceful manner, he offers "Peace man! Let there be 'peaceful and orderly' transfer of power." This should be the future picture of the dictator taken from the past -- waving goodbye to supporters and boot-lickers as he is leaving office for good. Part 6: Al Gore cartoons (b).